French niche line Parfums MDCI has launched the Masterpiece Collection, a new series of art-inspired fragrances. The first three — L'Homme Aux Gants, Bleu Satin and Cuir Cavalier — are for men. L'Homme Aux Gants ~ developed by perfumer Nathalie Feisthauer and inspired by Titian's Man with a Glove. "...a nuanced, sophisticated blend of oudh, spice, and woods designed for a gentleman who knows he's defined by more than the clothes he wears. L'Homme Aux Gants arrives on a wave of sweet, gently energetic Indonesian nutmeg, building into a warm, rugged heart of earthy cypriol and sensual hedione. But it's in the quietly powerful base that L'Homme Aux Gants truly comes to life, blending a soft, smooth oudh note with a rich melange of resins, woods, patchouli, and vanilla, creating a soothing yet complex aura that lingers for hours." Additional notes include cedar, gaiac, gurjum, tonka bean, benzoin and musks. Bleu Satin ~ developed by perfumer Cécile Zarokian and inspired by Thomas Gainsborough's The Blue Boy. "...a bright, fresh, exuberantly fruit-forward celebration of a scent, sure to appeal to lovers of fruity masculine scents everywhere. Impossibly juicy bergamot and electric green notes open the scent in full swing, while a deliciously fruity heart really separates Bleu Satin from its cohort, with sweet, intoxicating cassis and mouthwatering watermelon set against a hypnotically lush jasmine- fresh and elegant in equal measure. Finally, a base of gently-spiced leather lends longevity without sacrificing the vibrant spirit of the scent." Additional notes include bergamot, lemon, green notes, saffron and woody notes. 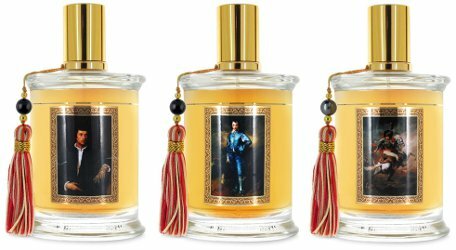 Cuir Cavalier ~ developed by perfumer Nathalie Feisthauer and inspired by Gericault's The Charging Chasseur. "...a richly spiced oud and leather scent that nods to the heavyweights of the smoky leather category while carving out a smooth, sophisticated niche all its own. Cuir Cavalier opens bright and fiery, with a crisp Italian red tangerine paired with a luscious saffron, leading into a rich floral leather heart. A warm, powerful base of oud and vanilla hums beautifully, a perfect chord with the still potent thread of saffron that continues to elevate the entire composition with a poised masculine gracefulness." Additional notes include rose, iris, cypriol, honey, cedar, tonka bean and musks. Parfums MDCI L'Homme Aux Gants, Bleu Satin and Cuir Cavalier can be found now at Luckyscent, in 75 ml Eau de Parfum for $250 each. These sound good, plus the bottles have nice historic images and tassels. Oh Robin, you’ve twice typed Fausthauer instead of Feisthauer. Or autocorrect has transformed it into Fausthauer. HA, thank you so much for noticing!! Not sure if I love the paintings, but at least it will be easier to identify the bottles, which is currently impossible without looking at the bottom sticker. A small tag, hanging on the tassel, would also help. Surely he’d be fine if I purchased that one?! Love that they’re using art like this. Green notes, watermelon, saffron, and leather all together sound like a hot mess to me. Luckily, at $250 a bottle, I won’t ever have to worry about smelling it. I do like those bottles though.